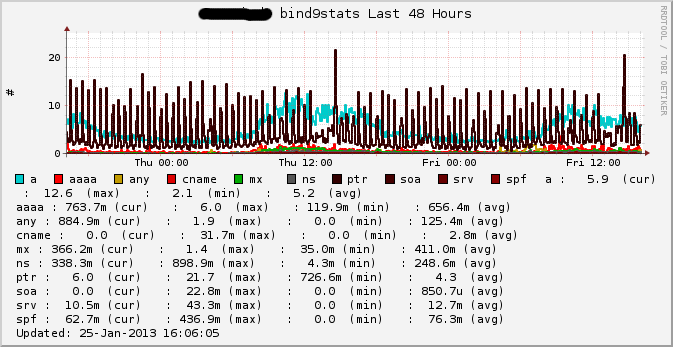 I couldn't find a satisfactory solution, so I wrote some ext script for bind9 stats to be used with my central monitoring xymon server. After that restart bind named to make the changes become effective. If you run bind chrooted you may need to create a symlink. Depending to the ownership of the stats file you may add the user hobbit or xymon to the group bind or named, too. May not be needed if you run the script with sudo as root. Apply logrotation on named.stats as it may grow very large over time. It may may result in graphs being reset, which I consider the minor problem compared to a full partition.